Back to Basics– Five Strategies for Becoming a Better Bartender – TAM Card® Nation in Vegas! There are a lot of things that go into a great bartender: a winning personality, an attention to detail, and a dedication to public safety, and the legal and moral issues of serving alcoholic beverages. Looking to improve on your own marketable bartending skills? Read on for some tips on putting your best foot forward. Get TAM® certified. Nothing is more important to your success as a hospitality professional than responsible service to ensure the safety of your patrons and to reduce the liability and risk for yourself and your business. Carry your TAM® card to show you received the best possible training, and sign up for one of our online or onsite classes today. Brush up on the latest cocktail and mocktail trends as well as any ‘back of the basics’ techniques you need practice with. 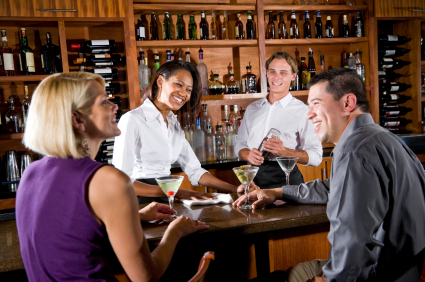 A great bartender will draw in more customers, making more money for the bar, and themselves. You’ll need solid working knowledge of bartending skills, plus lots of practice, so it’s important to learn how to mix drinks correctly, and build up your bartending know-how of tips and techniques. Check out blog post “What’s On Your Summer Reading List? Best Books for Bartenders” for some reading suggestions that might help you to increase your knowledge and skill level. Keep your bar well stocked, your work area clean and neat, and have glassware, liquor and bar tools in the most functional place possible. By having a clean, efficient and streamlined work area, not only will it set the stage for your guests, it will make it easier for you to do your job well and turn out orders efficiently and effectively. At the start of your work day, make sure everything is in its place, and when you have down time between mixing drinks, make sure to keep things neat and tidy. Excellent customer service comes easier if you keep a cool head under pressure. Providing the best customer experience possible will be much easier if you are able to keep calm on those busy Saturday nights behind the bar. Don’t over-commit yourself, if you feel yourself getting stressed, take a few deep breaths. Examine what tasks you need to complete, prioritize them, and eliminate any tasks that aren’t necessary. Also, don’t be afraid to ask for help if you need it. Your supervisor and coworkers are a part of your team and want to see you succeed, and your guests leave happy. Recognize your weaknesses and strive to improve. Nobody is perfect; maybe you’ve gotten constructive criticism from your manager in your last review, or maybe you’ve examined your own work performance and know areas you need to improve on. Whether it’s improving on multitasking, working under pressure, basic techniques, or something else, it can be done. Just remember that approaching your work with a glass half empty approach is never a good idea. Sometimes it can be difficult to see the good in a difficult situation, but do your best to think positively and work to make necessary changes. You should now be well on your way to making positive improvements in your work performance. What other advice would you give to someone looking to improve on their bartending skills and techniques?